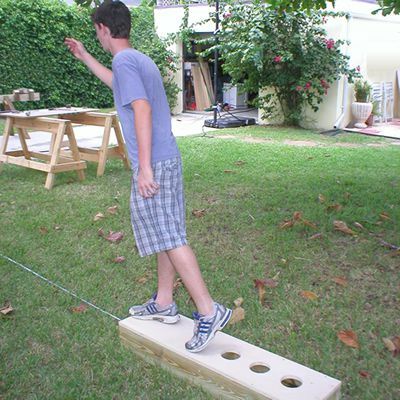 Washers is a fun backyard game for all ages. It's similar to horseshoes but doesn't require a dedicated playing area with sand pits and permanent stakes. A washer game set includes two wooden boxes connected by a 12-foot-long chain. Each box has a flat playing surface with three holes. Players stand on one of the boxes and toss washers (literally, big flat washers from the hardware store) into the holes of the other box to score points. You can build a durable washer game set in a few hours and set it up to play in your backyard, on the driveway, in the basement, or at your favorite picnic spot. Cut four pieces of pressure treated 2x6 lumber to 48 inches long, using a miter saw, circular saw, or jigsaw. Cut six pieces of the same lumber to 9 inches long. Place two 48-inch frame pieces over the ends of two 9-inch pieces to form a rectangle. Drill pilot holes, and drive two 2 1/2-inch deck screws through the long side piece and into the end piece at each corner. Repeat the same process to build the other box frame. Fit one of the remaining 9-inch 2x6 pieces inside each frame so it is centered end to end on the frame. Fasten the centerpiece with two screws at each end. These pieces serve as cross-members to strengthen the frames. Cut two pieces of 3/4-inch plywood to 12 inches wide by 48 inches long, using a circular saw or jigsaw. Fit each the plywood pieces over the box frames so that the edges of the plywood are flush with the frames at all sides, and the smooth sides of the plywood are facing up. Fasten the plywood to the frames with 1 5/8-inch deck screws. Draw a line down the center of each plywood playing surface, parallel to the long sides of the box. Measuring from one end of each box, make a mark along the centerline at 7 inches, 14 inches, and 21 inches; these will be the centers of the target holes. Adjust a pencil compass to a 2-inch radius. Place the point of the compass on the 7-inch mark and draw a 4-inch-diameter circle. Do the same at the 14-inch and 21-inch marks. Drill a starter hole for the jigsaw blade just hole inside the marked circle of each of the six target holes, using a 3/8-inch bit. Complete each cutout with a jigsaw, inserting the blade into the starter hole to begin the cut. Position a U-bolt at the center of the end frame piece on each box, using the end that's farthest away from the target holes. Tap the U-bolt with a hammer to make depressions in the wood, making the locations for drilling the bolt holes. Drill through the end piece at each mark, using a bit that is slightly larger than the bolt shank. Slip a key ring onto each U-bolt and insert the bolt into the two holes in the box end. Add washers and nuts to the bolt ends and tighten the nuts to secure the U-bolt. Attach a chain between the two key rings on the boxes so the boxes are exactly 12 feet apart when the chain is fully extended. Trim excess chain as needed, using wire cutters. Spray-paint the washers, using a unique color for each set of three washers. The colors identify the washers for each player. To play washers, each player stands on one of the game boxes and tosses their three washes, one at a time, toward the other box. Sinking a washer into the hole closest to the player is worth one point, the middle hole two points, and the farthest hole three points. Washers that don't go into a hole or fall off the board remain on the board for the round. After the first player throws all three washers, the second player throws their three washers, then the third player, and so on. When everyone has thrown their washers, the players move to the opposite box and collect their washers and count their points. The player that scored the most points in the round will go first on the next round, followed by the second-highest scorer, and so on. If a washer that is left on the box gets knocked into a hole by a succeeding player's washer, the original washer gets the points for going in the hole. The second player also gets points if their washer goes in as well. The game continues until any player (or team) amasses 21 points exactly. Should a player go past 21, they must drop their score back to 18 and continue. For example, if a player is sitting on 20 and tosses a 2, they'll add one point to get to 21 (which then reverts to 18) and add the second point to give them 19. Keep in mind that it is always beneficial to go as early as possible in every round. Any washers that don't make it into a target hole and are left on the board may be knocked into a hole by another player (giving the points to the person who threw the first washer), so the last player is at a disadvantage. Every player seems to have a different tossing technique. Some try to throw the washer as flat as possible with a low arc so that the washer lands and slides across the board. Others prefer to arc the washer high and end over end with a bit of backspin to try and coax it into the hole like a basketball. Practice and experimentation will help you find a rhythm and method that suits you.